For 2013-14, a student from Germany will attend Sayre for one year in 11th Grade. We also have a girl from China entering the Upper School in 9th Grade, and she plans to be here for four years to complete high school. She will join another boy from China moving up to 9th Grade after he enrolled in 8th Grade in January 2013. Submit a recent Test of English as a Foreign Language (TOEFL or TOEFL Junior) or other commonly accepted test of English proficiency. * Families moving together to Lexington from outside the U.S. should contact the Admission Office to discuss the standard admission process. Make an appointment for an interview with the nearest U.S. Embassy or Consulate to present the SEVIS I-20 form prepared by Sayre School. The visa can only be granted 120 days or less in advance of the beginning date of Sayre School for the upcoming school year. Make living arrangements and accommodations for the student’s 10-month course of study. Sayre does not provide accommodations for international students but can assist students in making local connections with possible host families. Sayre School is granted the authority to admit and host international students through the U.S. Department of Homeland Security’s Student Exchange and Visitors Program (SEVP). Once the student arrives and begins school, the Admission Office will monitor the student’s progress and his/her travel to and from the U.S. through the Student and Exchange Visitors Information System (SEVIS). 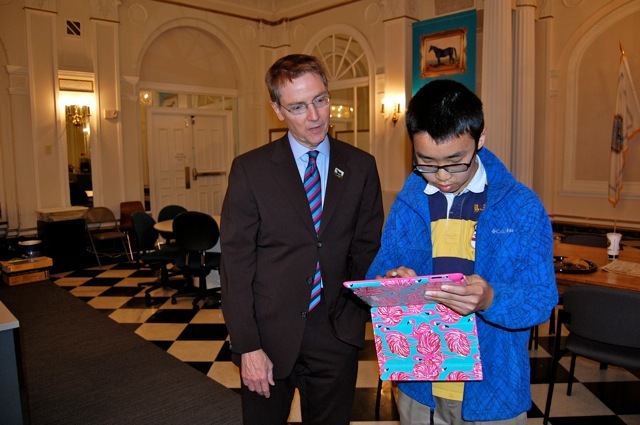 Tian Xie, native of Suzhou, China, and a new Sayre eighth grader, met Mayor Jim Gray on April 10th. Tian was also given a tour of Lexington's Traffic Management Center and received a pin of the famous race horse "Lexington." On April 12th, Tian will follow this trip with another outing in Lexington, this time to the Carnegie Center for Literacy and Learning and the Lexington Public Library. Tian's tour of downtown is part of the instruction he is receiving in English as a Second Language with Ms. Carolyn Hackworth. Over the years, Ms. Hackworth has tutored many International students at Sayre as they progress through their studies.